In October 2013, HAA joined with other community groups in launching a Village Lottery. Membership was £12 a year which entitled the purchaser to one unique number, many bought more. Numbers were entered in each monthly draw on the fourth Friday of each month. £3000 was raised in the first season and was shared equally between three community groups. The current season closes in November 2015 and will again have raised £3000 for the same community groups. The next season, January 2016 to December 2016 will launch in October. We decided that it was easier all round to run the lottery for a complete calendar year rather than starting in one year and finishing in another! This coming year proceeds will go to HAA and the groups within the Hassocks Community Partnership, which includes Light Up Hassocks and the Star Cinema. Details of the third season (January 2016 to December 2016) are now available here and click here for a lottery application form. Or to apply online click here. 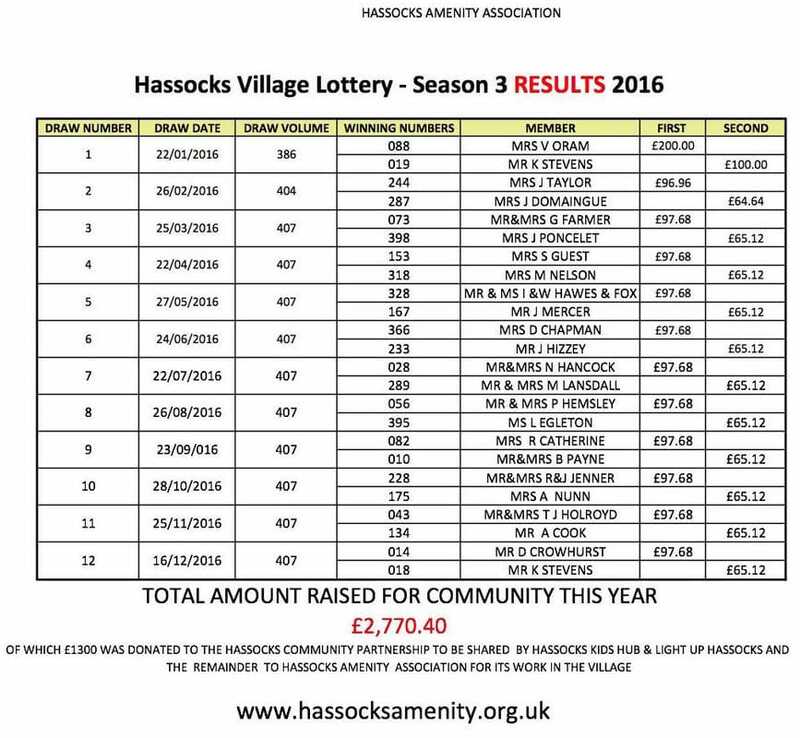 In 2016 we raised £4,860, paid out £2,089.60 in prizes, leaving a profit of £2,770.40 for the community, of which £800 was donated to the Hassocks (Kids) Hub and £500 to Light Up Hassocks. The balance will be used to support HAA’s ongoing work in the village.